While we were exploring Charleston, I stopped at a number of South Carolina historical markers, including: Thomas Smith [#10-03], St. Philip's Church [#10-06], The Siege of Charleston, 1780 [#10-65], The Seizure of the Planter [#10-76], Kress Building [#10-79], Jonathan Jasper Wright Law Office [#10-82] and U.S. Courthouse and Post Office/Briggs V. Elliott [#10-85]. 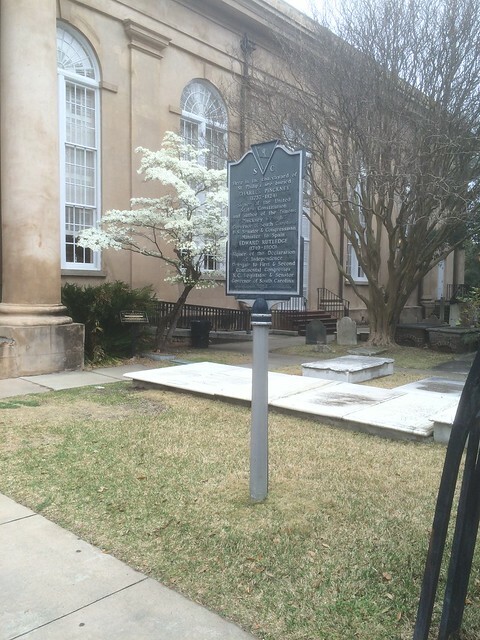 This marker is located at the 146 Church Street, Charleston, South Carolina. The GPS coordinates for this location are N 32° 46.724 W 079° 55.758. 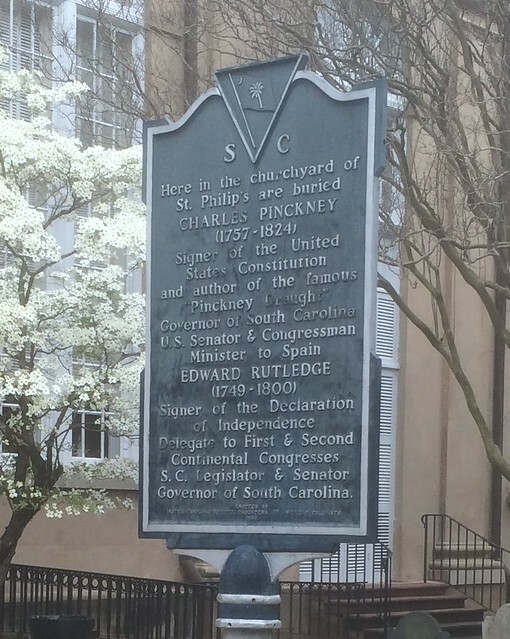 Here in the churchyard of St. Philip's are buried/CHARLES PINCKNEY/(1757-1824)/Signer of the United States Constitution and author of the famous/"Pinckney Draught"/Governor of South Carolina/U. S. Senator and Congressman/Minister to Spain/EDWARD RUTLEDGE/(1749-1800)/Signer of the Declaration of Independence/Delegate to First and Second Continental Congresses/S. C. Legislator & Senator/Governor of South Carolina.